Heeeey baby ladies. Sup? I'm really good at lockin' my knees and using my mom for support. I can stand, ya know. I'm only 5 months old, ya know. I mean, I may not be able to sit yet, but we don't need to talk about that. You dig?! would it be weird if I print out the picture and put it in my office? and on my fridge? Adorable! 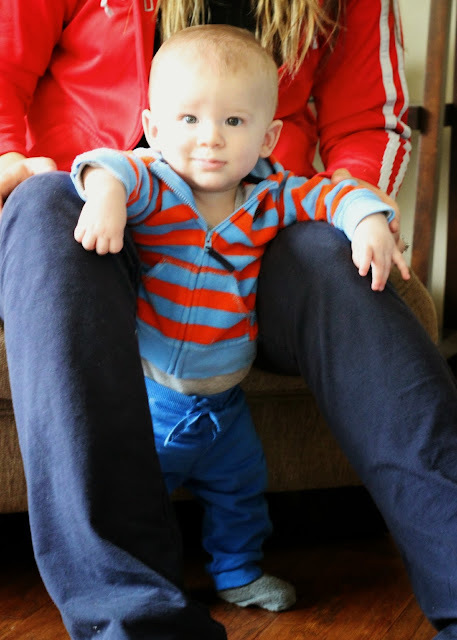 I have a feeling our little guys may go straight from sitting to walking, Mama. My little man has absolutely no interest in crawling, and will pull himself up from sitting position to standing whenever he has something to grab onto. In fact, he bumped his little face yesterday trying to pull himself to standing position in his pack and play. Lord help us - we may have some early walkers on our hands!!! may be the cutest pic of him yet! Which is saying alot!